While many who take depressants can handle them without abusing or misusing them, many individuals simply cannot. Depressants are often prescribed to those who struggle with anxiety or who are prone to panic attacks and anxiety disorders. They work by slowing down the activity in the brain that is responsible for anxiety, panic, and stress and many of them act as a tranquilizer or sedative. Close to half a million prescriptions for depressants were prescribed to individuals in a recent report by the Substance Abuse and Mental Health Administration. Unfortunately, many of those who receive a prescription for Depressants often abuse or misuse them which can result in addiction. When an individual takes these drugs, they are building up a tolerance to it which means they will either need a stronger prescription or they will need to take more of the drug in order to feel its effects. Not following doctors orders as it relates to dosing can have extremely adverse effects and can take a toll on the health and wellbeing of the individual. 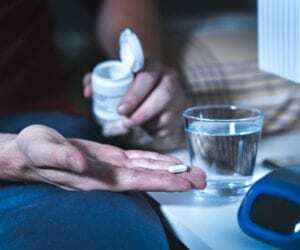 Those who take these highly addictive prescription drugs are at an increased risk of developing an addiction to them or other substances that have an effect. There are many long-term and short-term effects of depressants which can hinder the individual’s ability to perform their best in their job or as a parent. There is always the chance of an overdose on depressants if an individual takes a larger dose than the recommended dose. If the overdose is not caught in time and the individual is not administered an antagonist, life-threatening outcomes will ensue. The withdrawal symptoms occur as a result of a lack of the drug getting to the brain which can have these adverse effects. Depending on how long the individual has been dependent on this medication for, the withdrawal symptoms may be worse or less severe. If you or someone you know is abusing depressants or becoming increasingly dependent on them, treatment is required in order for them to make a full recovery. Typically, a period of medical detox is needed in order to safely wean the individual off of the drug prior to beginning in an inpatient or outpatient treatment program. Recovery is possible with the right help. cannot continue to abuse these substances as their dependency can quickly turn into full-on addiction.